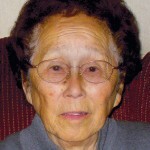 Emiko Masuda Komai passed away peacefully on April 19. She was 94. The third child of six siblings and oldest daughter of four sisters born to Kiyonobu and Haruno Masuda on March 7, 1919 in Los Angeles, Emi was predeceased by husband, Akira Komai, publisher of The Rafu Shimpo from 1946 to 1983. Together, they raised three children. Emi is survived by Michael Komai, Carolyn (Michael Matsumoto) Komai, Gail (Tommy) Miyasaki; grandchildren, Shawn Miyasaki and Brooke (Liam) Miyasaki-Lane of New York; and great-granddaughter, Scout Miyasaki-Lane of New York. Emi bore witness to the newspaper’s forced closing at the outbreak of World War II through its resurgence and growth following the war. She lived to see The Rafu Shimpo attain a special milestone in April, its 110th anniversary. While her name was rarely mentioned within the pages of this publication, she was an integral part of the newspaper’s triumphs, trials and spirit. She is also survived by sisters, Kiyoko Higuchi, Masae Arima and Tayeko Iwanaga; sisters-in-law, Kay Komai and Harumi Komai of Switzerland; and many nephews, nieces and their families. Two older brothers, Hajimu and Hiroshi, are deceased. With a gentle sense of humor, Emi enjoyed a simple life, whether it was going to movies or the beach, growing flowers and veggies, baking pies and breads, or sewing. Unbeknownst to her, she was this amazing “super glue” that held so many families together. Emi will be remembered as a deeply compassionate individual who loved her family, including three special dogs in her lifetime. She stood quietly by as a humble pillar of support for anyone lucky enough to cross her path. A family memorial celebration was held on April 29 at the Green Hills Memorial Park Chapel in Rancho Palos Verdes, officiated by Rev. Mark Nakagawa of Centenary United Methodist Church and coordinated by Fukui Mortuary.